Oh the stress of trying to be perfect! We all know there is no such thing, right?! But why do we try so hard to make our lives seem perfect when they aren’t even close. Christmas time just magnifies this ten fold, doesn’t it? Standing in line at the post office yesterday was eye opening. I’m not sure it is a good idea to put a lot of people in a tight space with heavy boxes and ask them to stand in line with strangers and be cordial for over an hour, someone is going to get cranky. In front of me was the sweet mom with two adorable little kids in matching snowflake sweaters. Her boxes were organized and she had all the tags matching and color coordinated, her forms were filled out, and she appeared to be on her A game. The guy in front of her, not so much. He juggled boxes and made numerous phone calls to try and get a correct address for his sister, much to the annoyance of the crowd as he began to use not so nice language and stormed out of line bumping into others as he left the building in a rage. The older gentleman behind me appeared to be immune to it all as he read his book and smiled politely at me. For those of you who know me, you know it is impossible for me to stand in a line and not try and talk to somebody! So I made small talk with the toddlers and shared high altitude baking tips with the organized mom. I didn’t want to disturb the gentleman reader so I once again politely smiled and then he said, “You know what everyone’s problem is? They want Christmas to be perfect and it was never meant to be that.” He put his nose in his book and looked very serious. I bravely said, “I agree,” which began a few stares and some uncomfortable shifting of boxes. A meaningful and at times spirited conversation ensued amongst my new postal acquaintances. Some of us believed in Jesus and others said they didn’t. They all agreed they liked to hear “Merry Christmas” and they all agreed the true spirit of Christmas has been lost in the consumerism and quest for perfection. Strangers started sharing traditions and we all agreed how annoying it could be when half the strand of lights goes out. We shared a few good laughs at stories of what goes wrong during the holidays and how the imperfect really is better. A lady who had remained silent for most of our chat time piped up and said, “I think it’s good for things to be off a little then we don’t get too big for our britches.” How true. I came home and plugged in the Christmas tree and yes, a strand of lights was not working. I laughed out loud and decided to keep them that way. 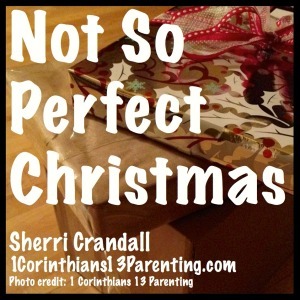 How can you embrace the imperfect this Christmas?